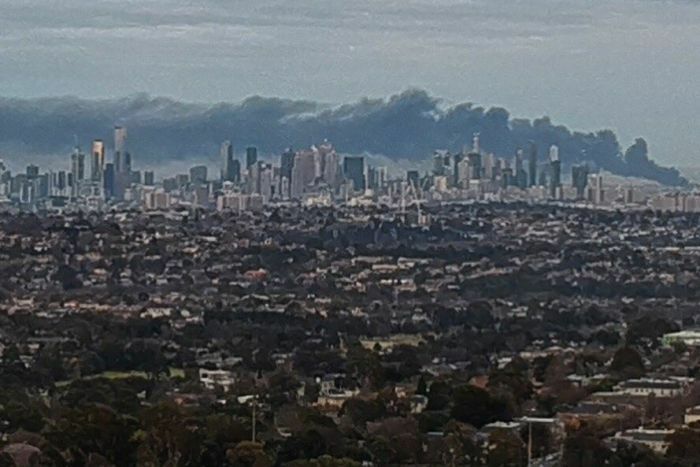 Schools have been closed and residents in parts of Melbourne’s west have been told to shelter inside as a huge factory fire sends toxic smoke into the suburbs. The Metropolitan Fire Brigade (MFB) said the West Footscray fire began early this morning and more than 120 firefighters were fighting the fire, with 30 trucks and cherry picker aerial appliances on the scene. 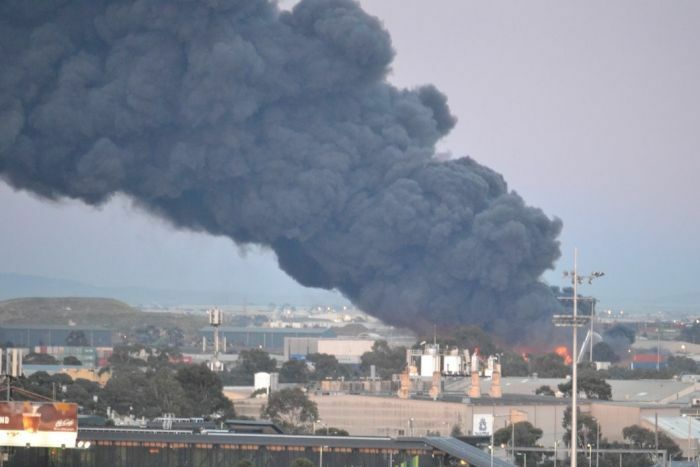 The MFB warned residents there was toxic smoke within a two-kilometre radius of the factory, and issued a Watch and Act message urging everyone within a 500-metre radius to take shelter indoors immediately. Residents were advised to shut doors and windows and switch off heating and cooling systems to prevent smoke getting into homes. 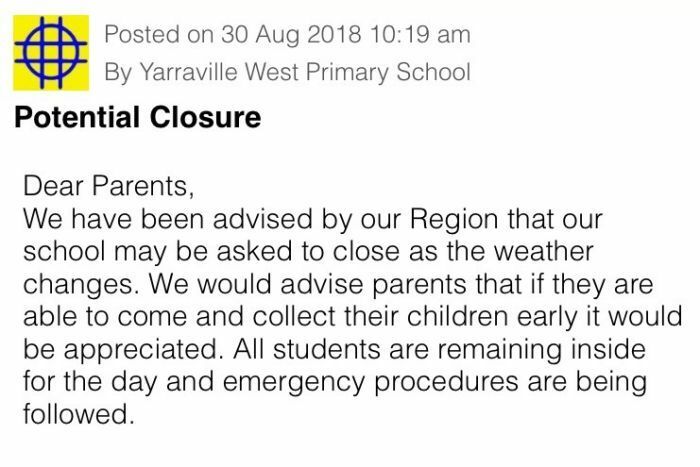 Several Catholic schools in the area have closed, including St Augustine’s Primary School in Yarraville. Parents at some nearby public schools were told their schools may need to close earlier than normal if the weather changes. Nearby schools are keeping children indoors. Footscray Primary School, which is around three kilometres from the fire, told parents it was following advice from Emergency Management Victoria to operate in “lockdown mode”. “When arriving at school this morning, please immediately make your way inside a school building,” a message sent to parents said. MFB acting deputy chief officer Ken Brown said a containment strategy to prevent the fire from spreading to neighbouring factories was working, and foams were being used to extinguish the blaze. “The effort now will be into containing the fire completely to the building and then extinguishing it,” Mr Brown said. He said the building contained asbestos and crews were trying to reduce the risk of fibres spreading into the air. MFB tweets: At the moment more than 20 firefighting appliances are on scene at #WestFootscray including aerial appliances which are attacking the blaze externally and from above. “We instigated our asbestos procedures very early into this fire, so wetting the material actually minimises the exposure,” Mr Brown said. Mr Brown said firefighters would monitor particulates in the air to assess the risk to people nearby. The storage factory also contained acetone and a welding chemical, he said, and explosions posed a risk to firefighters when they arrived. “We had some 44-gallon drums explode and fly through the air, which is a concern for our firefighters,” he said. Zalika Rizmal tweets: The fire is still raging in West Footscray, with large flames, fireballs and dark plumes of smoke in the area. More fire trucks arriving. Earlier, Assistant Chief Fire Officer Rob Purcell said residents should close their doors and windows to avoid the toxic smoke from the fire. “All smoke is toxic. This is particularly black — there’s probably some hydrocarbons in there, that’s the reason it’s the colour it is,” he said. Anthony Gracia tweets: the huge fire in West Footscray, Melbourne – as seen from Yarraville. Thick black smole and popping sounds like gunfire. Yarraville resident Cassie Smith-Moir, who has worked as a firefighter, said she could see the smoke outside her home when she went outside about 5:30am. “There was really thick black smoke — from the street you could see periodically there’s been flames shooting up, and aside from the constant fireworks sound there’s an occasional larger explosion,” she said. A talkback caller, Bruce, told ABC Radio Melbourne he watched as the toxic smoke snaked its way over his street in Yarraville. “I’m standing in my front yard watching the plume of smoke cross over my neighbour’s house on the other side of the street,” he said. 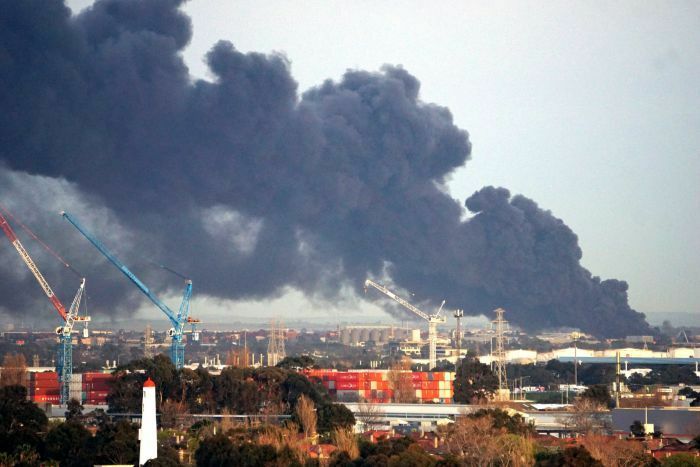 Another caller, Ian, said he could see the smoke from Geelong. “You can see the smoke and flames coming up over, building up to the height and then just plateauing out and filling into the clouds,” Ian said. Somerville Road and Paramount Road were being kept clear to help emergency services reach the fire, authorities said. Mr Brown said most of the smoke had been blown up and over the bay, and no evacuations or major road closures were planned. “We’ll assess it as the smoke plume comes down,” he said. “We’re looking at Geelong Road and the West Gate Freeway — we don’t plan to close that, we’re just monitoring that to make sure that the traffic is safe and that people in the area are safe,” he said. Previous articleLanny Davis burns reporters. Should they still give him a megaphone? Can Trump use military construction funds to build his wall?